The leader of Sinn Féin has said the party has been consistent on its position on holding a referendum on Irish unity. Speaking on RTÉ's Morning Ireland during her party's think-in in Co Cavan, Mary Lou McDonald denied that she "flip-flopped" on the matter. Earlier this summer, Ms McDonald said a poll on Irish unity should not be held while uncertainty around Brexit remains. The following day, she said that in the event of a hard Brexit such a referendum would be "imperative". 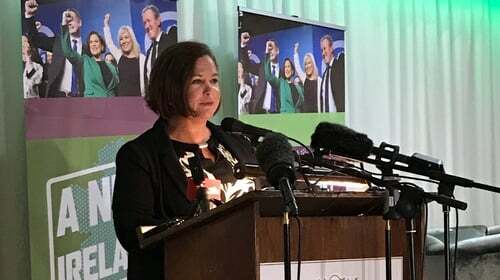 This morning, Ms McDonald said that while such a poll being held in the event of the UK "crashing out" of the European Union would not be ideal, if Britain insisted on doing so there would have to be a referendum on Irish unity because the UK could not "inflict that level of damage on the country". The party’s finance spokesperson, Pearse Doherty, has said he believes there would be increased public services and an increase in the number of people carrying out public services in the event of a united Ireland. Mr Doherty was responding to questions about an internal party draft document, which stated that a united Ireland would be lead to efficiencies in public services. He said there would be duplication in public services in the event of a united Ireland and patients would want to see a manager in the north and also in the south. However, he said they would want to see more front line staff. Mr Doherty also stated that Sinn Féin would also be proposing a number of measures for the upcoming Budget to help tenants. He said it would also favour investment in affordable housing and it would be announcing a new housing strategy next week. Ms McDonald also said that she did not believe her party's motion of no confidence in the Minister for Housing would be defeated. Sinn Féin has confirmed that it will table a motion of no confidence in Eoghan Murphy in the coming weeks. Yesterday, Fianna Fáil confirmed it would not support any such motion. Ms McDonald said she believed there was strong feeling across the Oireachtas that the minister's policies were not working. She added that the reason it was putting the motion forward was because of the amount of families living in emergency accommodation and the uncertainty faced by people in the rental market. Ms McDonald also confirmed that she had requested a meeting with the newly sworn-in Garda Commissioner, Drew Harris.